Patti Colbert is the gracious recipient of the 13th annual Equine Industry Vision Award. 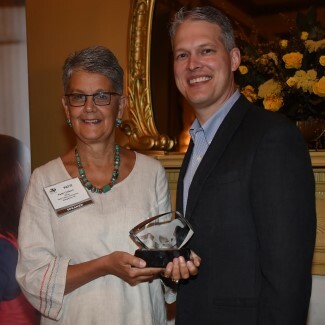 Zoetis, in partnership with the American Horse Publications (AHP), presented the award to Patti on June 20, 2014, during the AHP Gallop n' Grits Seminar in Charleston, South Carolina. The Equine Industry Vision Award is the first major award to showcase innovation across the equine industry. Established and sponsored by Zoetis, it recognizes ingenuity and service, and it serves to inspire those qualities in others. Patti Colbert was awarded this honor because of her numerous important contributions to the equine industry. Most recently, her efforts have been focused on marketing Time to Ride, an initiative of the American Horse Council’s marketing alliance formed to connect people with horses and designed to encourage horse-interested consumers to enjoy the benefits of horse activities. Past career highlights include her role as senior director of development for the American Quarter Horse Foundation. During her six years at AQHA, she raised millions of dollars for the foundation. Patti is no stranger to awards. The National Cowgirl Museum and Hall of Fame referred to her as a woman who “shapes the West” and “changes the world”, when awarding her the Fern Sawyer Award in 2011 for her support of the museum and for creating the concept for the Cowgirl U program. In 2012 she received the Legacy Award – Great Women of Texas from the Fort Worth Business Press. Today, Patti is the owner of Patti Colbert Enterprises, leading a team that offers marketing and event management services to a variety of clients and provides talent management and promotion for unique individuals and events. See her latest work at TimeToRide.com. Other finalists for this year’s award included Molly Sweeney, vice president of Horses and Humans Research Foundation; Lyndsey White, co-founder of Riders4Helmets; and the Retired Racehorse Training Project.